The Palestinian Health Ministry has reported that a young man died, Wednesday, from serious wounds he suffered during the Israeli war on Gaza, in the summer of 2014. 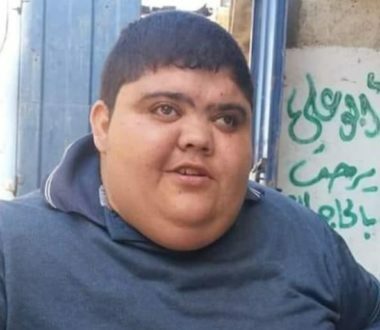 The Ministry said the young man, Eyad Yousef Suleiman, 25, was injured during the extensive Israeli bombardment and shelling, and died from serious complications. Suleiman was from Jabalia refugee camp, in the northern part of the Gaza Strip. On November 3. 2018, a Palestinian child, identified as Mohammad Nasr al-Reefy, 14, died from serious wounds he suffered on August 21, 2014. Medical sources said the child suffered injuries and shrapnel all over his body, including a piece in his spine, resulting in quadriplegia and various health complications. The Israeli missile instantly killed the child’s brother Omar Nasr Ziad ar-Reefy, 4, and their father Nasr Ziad ar-Reefy, 35, in addition to his cousin, Abdullah Tareq ar-Reefy, 7, and Abdullah’s brother Ziad, 13, along with their father, Mohammad Ziad Abed-Rabbo ar-Reefy, 28. The Al-Mezan Center for Human Rights said the soldiers killed at least 2218 Palestinians during the 51-day Israeli offensive on the coastal region, while dozens later died from their serious wounds. Around 84% of the slain Palestinians were civilians, including hundreds of children. Al-Mezan stated that the Israeli bombardment and shelling of Palestinian homes, residential buildings and structures, resulted in wiping out entire families, while dozens of families lost multiple members. According to UN OCHA, 142 families lost 3 members or more in the Israeli attacks.